A veiled Muslim woman from Dearborn alleges she was abused on a flight from Florida to Detroit. The woman’s brother, Abed Ayoub, is legal and policy director of the American-Arab Anti-Discrimination Committee. The video of the reported incident shows a Delta flight attendant telling the woman to switch seats. 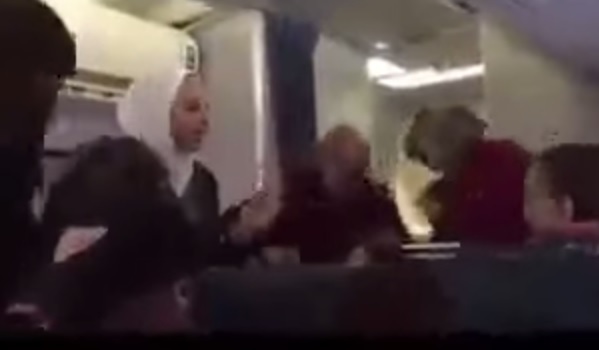 The flight attendant obviously thought the Muslim woman was the problem here. An Arab-American Muslim woman from Dearborn who wears an Islamic head scarf, or hijab, said she was harassed by another passenger on an airplane and then told by a flight attendant to move. Darlene Hider, 32, of Dearborn said she was with her four kids and husband on a Delta Air Lines flight on Monday from Florida back to Detroit when another woman yelled at her, “This is America!” and insulted her because of her Islamic faith. Hider’s brother, Abed Ayoub, a Dearborn native who is legal and policy director of the American-Arab Anti-Discrimination Committee, described what happened to her in series of tweets Monday night that drew widespread attention, including retweets from actress Mia Farrow.